Hoping to get some advice from you all about cleaning up a blade myself. 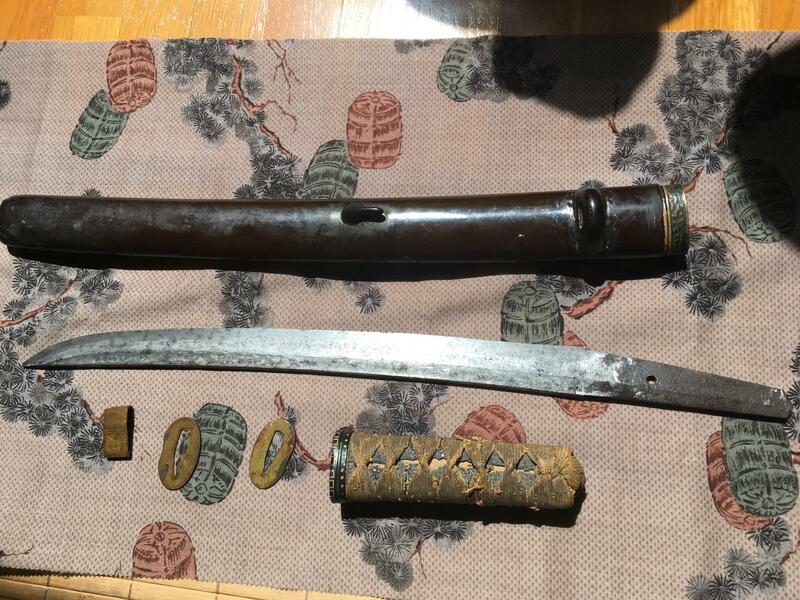 I’ve been collecting nihonto, and nihonto books for a good long while, and I have employed professionals to do restoration work in the past numerous times, but I would very much like to try and clean (just clean, not restore, not polish) this sword and koshirae myself. Clean as much of the rust off of the blade as possible without damaging the jacket steel. —In my mind, sandpaper, wire brushes, steel wool, etc. are NOT options. Those options would certainly be quick, but they would potentially compromise the jacket steel and disfigure the blade. —I am hoping to find some advice about specific chemicals, oils or electrolytic processes, etc. that can be used in combination with “elbow grease”, to slowly work away the rust on the blade and fittings. Ideally these would be chemicals and oils that will not end up “acid etching” the blade in the process. —Electrolysis to remove the rust may not be possible because I don’t want to remove the rust from the nakago, and submerging the entire blade in order to remove the rust on the blade via electrolysis would probably result in that. Submerging it in part could be possible...? I will likely end up leaving the saya the way it is with the exception of cleaning up the kojiri as described above, and the koiguchi as described below. —Do you think I need to remove the kojiri to do this? It seems I would need to given the amount of rust it has picked up, but perhaps not. —I would appreciate any advice about removing the kojiri and reapplying it after cleaning, if people think that is necessary. I will likely keep the tsuka wrapped the way it is. I like the old worn look that it has, and I don’t want to try and do much with that. It looks like it is still tight and was well made at the time. Cleaning the menuki a bit would be nice but if they’re impossible to get out then I’m not going to fuss with it. I would appreciate any advice people would offer about cleaning up the tsuba. I don’t need it to sparkle or be shinsa worthy, but it would be nice if the details of it were a little less obscured. I suspect in this case that just a little bit of cleaning with the right polishing product and an appropriately thick rag would get me to the goal, but I have never really done anything like this myself so I don’t know what the best approach is. 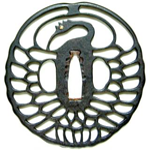 The habaki, koiguchi, fuchi, and kashira I think similarly to as the tsuba. I do not have any interest in trying to remove the kashira to clean it. I do not think of this blade as a project for the purposes of fixing it up and getting it ready for shinsa. I already have a Nidai Muramasa tanto (passed NTHK-NPO by Miyano, now in line for NBTHK shinsa) and a Ko-Gassan tachi (again, passed NTHK-NPO by Miyano, now being polished by Usuki sensei) so I have enough projects, and I know the difference between a Juyo candidate and a nice old blade that deserve to remain a nice old blade. 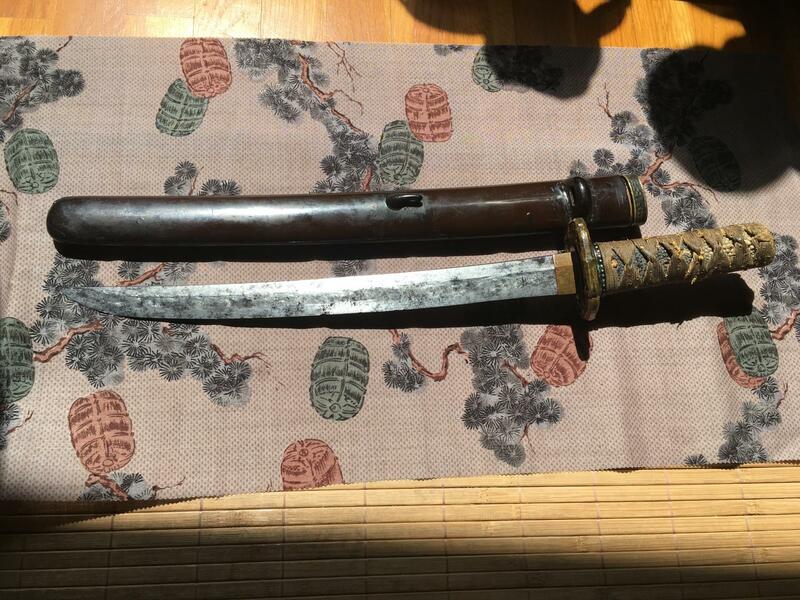 From what I can see in the photos the seller provided, this is not a gem of a blade anyhow but it is nihonto. It is not a premium length, certainly made later than Shinto, maybe even Edo and maybe in the original koshirae, though I can’t quite tell if the tsuka has two holes in it or just some damage next to the mekugi. 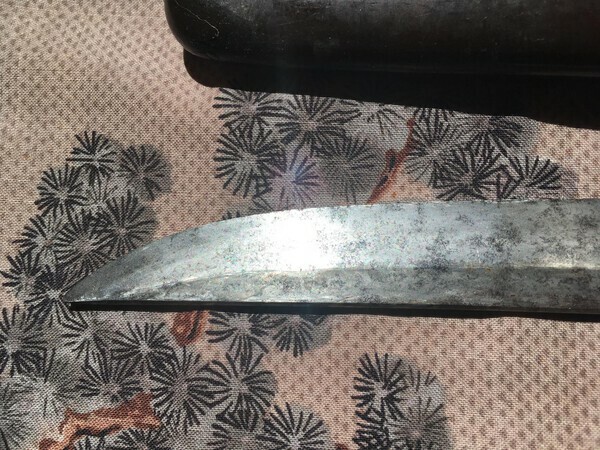 I can see a hint of notare in what little is visible of the hamon, obviously mumei, maybe a little bit of machi-okure, has been polished a few times in the past given the declining notch at the hamachi. The end goal here is to make the sword into a respectable but NOT mint condition, NOT shinsa worthy, example of an old working blade. I don’t want to make it into a museum piece here folks, I just want to honor it by getting it back into appreciable condition, preserve it further, and not have to spend thousands of dollars doing it. Any advice you might have to help me achieve this goal would be appreciated. Larger format photos, and some closeup shots would definately be helpful. Any thoughts on non-abrasive methods to get rust off a blade? There aren't any John. If there were, we would all be doing it. Over a long time. And uchiko (only on very out of polish blades) over many months. That's about it. Has anyone ever tried CLR? Or is that too acidic? I may try this on another rusted steel before hand. Seems like it could be a good option...?? As Brian wrote: There are no products on the market that an amateur could use without damaging the blade. There are of course chemicals to transform rust into something less aggressive, but they are good for garden tools, cars, iron bridges and towers a.s.o..
Take a moment to think about what rust is: Rust is iron (element Fe) that has turned into a chemical compound (rust = Fe2O3) together with oxygen (element O). Rust is not something that covers the clean iron/steel like a layer of dirt - the iron surface itself has partly turned into something else. If you could remove the rust completely, the surface would be coarse and look probably like a natural stone, depending on how deep the rust has worked itself into the steel. Or you could say: How deep the oxygen had been allowed to attack the steel, chewing up Fe molecules and turning them into rust. 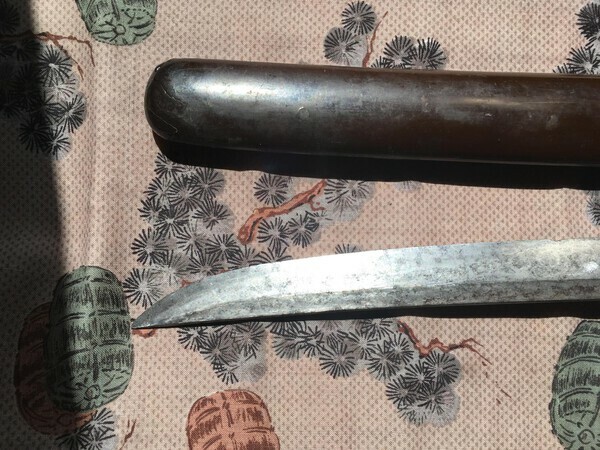 Bringing a rusted blade back to a state where you could see the HATARAKI and HADA will always mean that you have to remove some of the steel surface until you have a clean, level and very even metal surface. THEN - and only then - you can start to restore the blade. Not easily done and nothing for non-trained people. Hello John, another option is not to spend more money on pieces that have no arrangement and save it for when you can buy a piece in good condition, I say it as a tip because that katana without a polishing will look bad, I have restored some piece in better state than that and neither the hamon nor the fairy is appreciated, it will simply look like an old katana. A greeting to all Daniel. What Jean said above is correct. The reason there are so many out of polish blades on the market is that it is not economically feasible to have them professionally restored. Trying to restore them nonprofessionally is just contributing further to their demise. Don't do it. Save your time and money for something more rewarding. Looking at those photos, John, I have to agree with everyone else. Don't do it, & get your money back if at all possible. 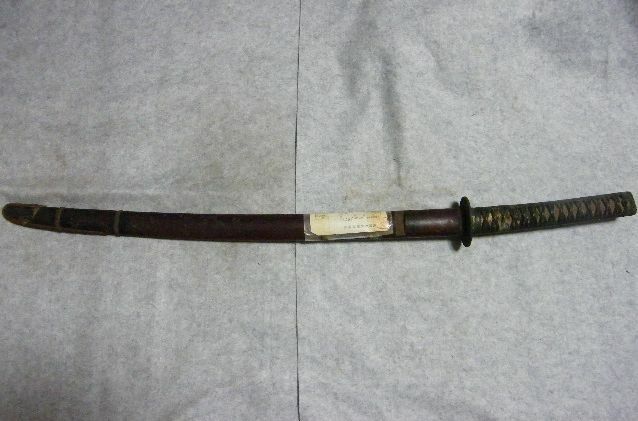 I believe that I made it clear in the original post that this is what I want it to look like, an old katana, but with less rust and muck on it... I already have plenty of more valuable swords to appreciate. However, FYI, there is room in collecting for buying things with no potential for Juyo, particularly if you want the project for yourself... I like the package as a whole of this blade, and I want to put just enough elbow grease into it so that I can clean it up and let it live looking like an old working blade. So you think I will get no pleasure and reward from learning how to do some simple cleaning/restoration myself, and bringing back a little bit of life to an old blade in the process? I've already got 55,000$ worth of Nihonto, 15,000$ worth of "Japanese-style" swords made by US swordsmiths, and 20,000$ worth of Nihonto books. What I want is a project, and if you don't have aything to share about how to undertake my project, then I'm not sure why you are posting a comment at all. 420$ for this blade with a full koshirae (even in poor condition) is a VERY fair price for an old blade and its furniture. I knew what I was buying when I bought it, and I'm not asking for my money back because I bought it so that I could HAVE A PROJECT FOR MYSELF. Sorry if I'm coming across as defensive here folks but I honestly DID NOT come here asking for advice about whether or not I should restore this myself, or whether it is worth my time to restore it, or whether I should save my money for more valuable swords, etc. I asked for advice about HOW TO GET THE RUST OFF OF IT, AND CLEAN IT UP. I didn't buy it because it's a sword worth submitting to shinsa, or even potentially worth more than what I paid. I didn't buy it because I'm a newbie and I haven't saved up enough for other more immediately appreciable, or valuable swords. I didn't buy it because I made an impulseive decision and should regret it enough to ask for a refund. etc. I bought it because I want a nice little project for myself, and I came here for some advice about how to achieve my goals without ruining the spirit of the blade in the process. Fortunately I have had a few people contact me privately and give me some of the advice I needed, so the post still served its purpose, but at this point if you don't have anything productive to add then I'm going to have to ignore your comment. Went back to look at pix...seems someone did a section already. Nothing wrong in what you want to do. Lots knee jerk reactions here...they ment good dont take it the neg way but positive side. You have to understand something VERY clearly here. This forum has people from over 32 countries. And MOST of those guys do not know you, and do not know that you are not some novice who inherited a bunch of expensive swords and knows very little. I DO know you are an advanced collector. But when you have some guy that overseas people do not know from a bar of soap, and we all start giving advice on how to remove rust and start restoring a blade, then you have hundreds of novices out there reading and thinking "Oh...I can do that!" And then we have become some forum telling people to use X or Y on a rusted blade, and once they start that, you just know they are going to think "Hmm.. 2000 grit sand paper can't harm a sword, let me try that. And when that does little, they are thinking...maybe 1000 grit won't harm too much....etc etc" and then we are all done. No ways to answer your question above without telling novices that it is ok to experiment with rust removal, and no way to stop them going further. And as an advanced collector, you KNOW that is a rocky road to go down. For this entire hobby. So yes, your intentions are good, and are known, and I do not worry about what you will do. But I do worry about all those thousands of amateurs reading who are just waiting for a sign that it is ok to start messing with the sword that grandad brought back from the war. And that sword might be something good..and they have no way of knowing that. So cut us some slack when people reply. It isn't always focused on you. Sometimes it is general well intentioned advice to others reading who don't know what you do. That should it after application, enter into any ware or fault line in a blade, it has the possibility to be difficult to neutralise. Should it then be over sealed with an oil, the consequences could be dire. But if we consider already abused nihonto as worthless, and worth experimenting on, then so what? Me! Thats a nettle I can't grasp. And John there is no reflection on you in my post, its an opinion I have gained from advice given. Should I be proved wrong, its an opinion that I can certainly change. Your point is well taken Brian, and I apologize if I came across aggressive in my response. I do feel that I was clear in my original post though that I was looking for non-abrasive methods that would not damage the blade, so what you are indicating was addressed originally in my post. Perhaps not well enough. While I can already hear the moaning and groaning, there is an option for cleaning off heavy rust, nevr-dull. But, but, let's make it perfectly clear that while the nevr-dull itself will not harm the blade and remove the heavy dirt, grime, and rust, the outcome will be far from the point of being able to see features of the hamon or any formations in the steel. In fact they will become obscured. Nevr-dull was developed for cleaning and shinning auto chrome bumpers, not seeing details in forged steel. As one uses the small swatches of nevr-dull pulled off it is essential to understand, realize, that you are now rubbing the dissolving dirt, grime, and rust over the surface of the blade, which could in fact cause damage. Therefore, in order to minimize any damaging effect, it requires great patience, rubbing small areas at a time, frequent changing of swatches, frequent clean new tissue wiping, frequent (sword) oiling, followed by more wiping, then repeating the entire process again, and again, and again, until the blade reaches a satisfactory condition of being clean. BTW, while the nevr-dull is not chemically harmful, you'll still want to be wearing protective gloves like medical gloves. Then, once the dirt, grime, and rust are gone, careful alternating use of uchiko (sorry Darcy) and oil can begin to reveal, bring out, the shape of the hamon. Even so, don't expect to see too much more than outlines. Also, keep in mind that these rusty old blades can still cut like crazy!!! Keep fingers away from edge. Is your tetanus shot updated? As for fittings, imo, fittings can be ruined very quickly if you don't know what you're doing, perhaps even more so than swords. Further, while I've done what is described above a number of times, I knew exactly what I had before starting. And that is probably the most important point. 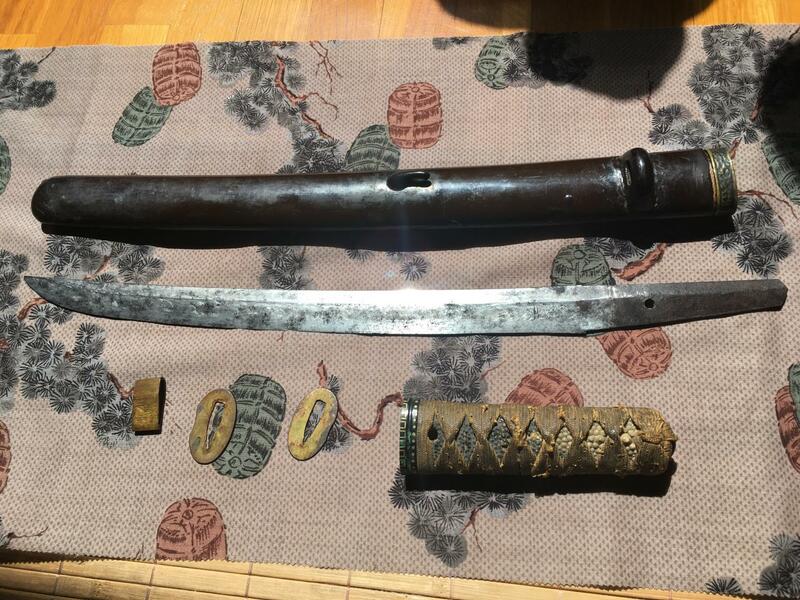 A possibly old koto sword, an important signed sword any age, I would not touch. .......-eye rolling- I AM GOING TO DO IT. ...the outcome will be far from the point of being able to see features of the hamon or any formations in the steel. As one uses the small swatches of never-dull pulled off it is essential to understand, realize, that you are now rubbing the dissolving dirt, grime, and rust over the surface of the blade, which could in fact cause damage. Is your tetanus shot updated? ...I knew exactly what I had before starting. And that is probably the most important point. Thank you for a very helpful and informative response Franco! I assume that is the product you are referring to. As for the outcome, I only hope to get the rust off. Seeing the hamon at all would be an added benefit. Other people I spoke to privately warned against the same. They suggested a “pinch” maneuver with the fingers where possible to avoid this. My tetanus is up to date. Part of my job working at a hospital. How do I feel your reference to ‘snide remark’ is directed at me. Allow me to assure you, sneering was not my intent, but can now see it was misplaced humour. I will bear this in mind in future exchanges, which I hope we can continue to have. Glad to see the outcome of your hard work Daniel! It will be a while before I can start my project, but I look forward to sharing the results online here as well. The best that I can offer for menuki and ito on a tsuka is to use kids foamy soap that is sprayed on and a used clean soft toothbrush. 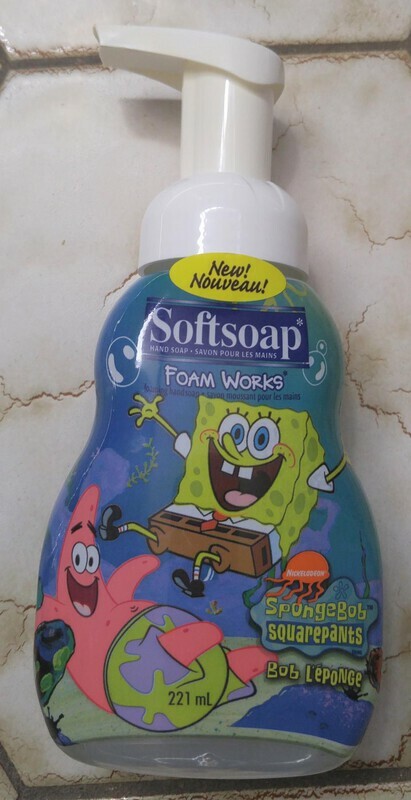 The foamy soap is gentle and odorless. I also use the same stuff on tsuba and f/k. Dry well as you do not want to promote rust on iron fittings. Thank you Barry! Will try this for certain! I have done restorations for damaged coins for years, mostly PVC damage. I would imagine that cleaning your sword and fittings would work in much the same way since the objective is to clean without damaging the surface. For your non ferrous metal parts my first step would be to remove the accumulated grime with a product called Goo Gone. This is a product that will remove oil based grunge and is will not damage the metal surfaces. Now, I do not know if it will have any effect on the patina created by the artist so I would test a small area first. When I am removing PVC I dab the goo gone on with a q-tip and let it set for about 5 minutes. Do not scrub or wipe off, as that will leave marks on the metal. I then make a mixture of water and windex 50/50 and put that into a Waterpik dental flosser. I put a bowl in the sink to catch the liquid from the process because you will probably need to repeat the process. When it comes to the blade the first step is to remove the grime, this will undoubtedly reveal much pitting and contamination from the rust since it eats into the steel like rot. I would first use Goo Gone on a cloth rag. This will remove organic compounds and clean the blade. If the rust is still thick the next step would be to use CLR. That should remove the oxidation although you may have to apply several times. When complete wash the blade with dish soap and water. Now, CLR is a light acid but it will be less destructive than steel wool. I would wrap the tang to prevent accidental rust removal. And now we see why these things are not discussed; destructive and acidic chemicals are being introduced into the discussion, and amateurs will think "hey, i read that on the Nihonto message board, it must be ok". All due respect Doctor, if you want to know about methods, ask privately to people who can help, not in an open post. yes some post do need to be deleted, stones, cleaners etc.